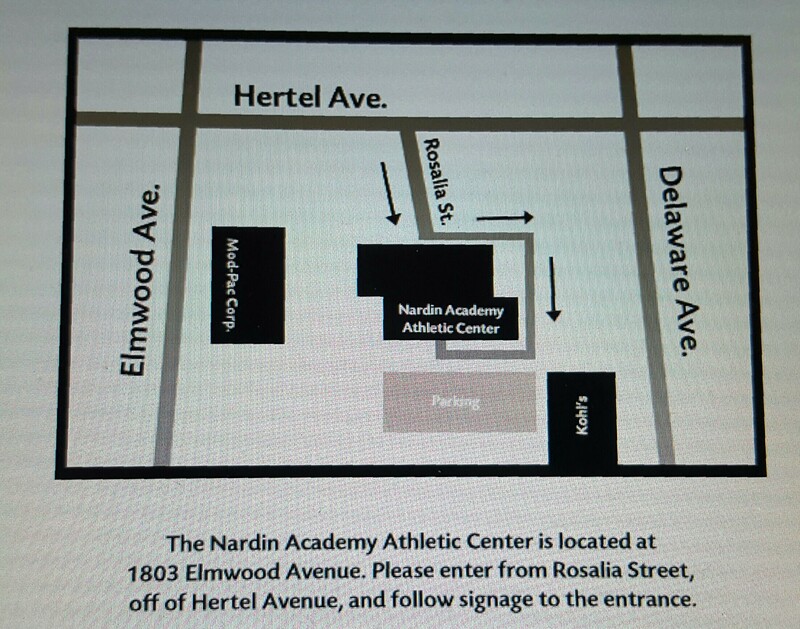 The Nardin Indoor Soccer Facility is located at 1803 Elmwood Avenue in Buffalo, located on the Modpac site, right behind the Big K-Mart and Kohls on the corner of Hertel Avenue and Delaware Avenue. From the north, take Interstate 190 South to Route 198 East (Scajacquada Expressway), or take Colvin Blvd. to the Delaware Park entrance at Amherst Street. From Route 198 East, exit at Delaware Avenue North (2nd Delaware exit), and then turn right onto Nottingham Terrace at the first traffic light. Park at your first opportunity on Nottingham. From Colvin, enter the Park and proceed on the Ring Road bearing right. Park wherever you can along that road. From the south, take Interstate 190 North to Route 198 East and proceed as above. From the east, take Route 33 West toward downtown. Exit onto Route 198 West, and then exit at Parkside Avenue and proceed north to 2nd traffic light (Jewett Parkway). Turn left into park and follow the Ring Road around to opposite end of the park. Park where you can along the Ring Road opposite the point where you entered the park. From the north or south, take Interstate 190 to Route 198 East (Scajacquada Expressway). Exit at Parkside Avenue and turn into park at the Jewett entrance. Park wherever you can as soon as you enter the park. The field is directly across the Ring Road from the park entrance. You can also gain access to Delaware Park at the Southeast park entrance near Parkside and Route 198. You must be south-bound on Parkside and you will see the entrance immediately before the traffic light at Route 198. Turn right into the park and find parking on the Ring Road. This will get you closer to the field, but it is more difficult to find. From the east, take Route 33 West toward downtown. Exit onto Route 198 West, and then exit at Parkside Avenue and proceed north to 2nd traffic light (Jewett Parkway ). Turn left into park Park wherever you can as soon as you enter the park. The field is directly across the Ring Road from the park entrance. The Tennis court fields are located inside Delaware Park just past the Colvin entrance. Enter via the Colvin entrance to the Park and bear right on Ring Road. You will see the Tennis courts on your left. Located off of the intersection of Hertel Ave and Elmwood Ave. Located off Amherst Street, just west of Colvin Boulevard and the Buffalo Zoo. From the north, take Colvin Blvd. to Amherst Street and turn right, or take Delaware Avenue to Amherst Street and turn left. From the south or east, take the Scajaquada Expressway (Route 198) to Parkside Avenue. Turn north on Parkside to Amherst Street. Turn left on Amherst Street and cross Colvin Blvd. Located in Delaware Park near the Rose Garden. To access the field, take Delaware Avenue southbound from the Scajacquada Expressway (Route 198) and proceed through the "S" curves to the first traffic light at Forest Avenue. Take a hard right onto Rumsey Road. Park along the road. The field is about 50 yards to the right through the trees. Located at Buffalo State College. 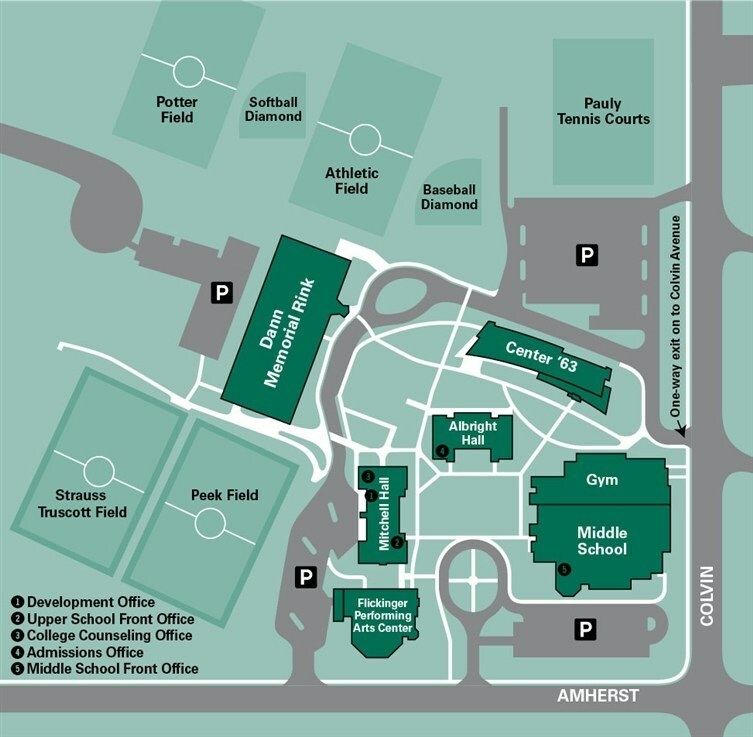 You may enter the campus at Elmwood Avenue and Rockwell Road. Make a right onto Rees Street. You may also enter from Grant Street. Please note the one way signs. Field behind the school with the same name on Military Ave. across from the American Brass plant in the city. 155 Lawn Ave., Buffalo, NY 14207, corner of Military Road and Lawn Ave., by the Northwest Community Center. Located on Main Street near Sisters Hospital. From the 190, take the 198/Scajaquada Expressway to the Main Street exit. Turn left ( northeast ) 1/8 mile past Sister's Hospital. Turn right on Dewey and field entrance is on right. Located on Vulcan Street in the Riverside section of the City of Buffalo. To access the field from the south, take the Niagara Thruway (Interstate 190) northbound and exit at Vulcan Street. The ramp will lead onto Niagara Street and you will take an immediate right onto Vulcan. Follow Vulcan for approximately 1 mile and the soccer fields will be on your right. From the east or north, take the Youngmann (Interstate 290) to the Niagara Thruway and exit on Kenmore Avenue/Sheridan Drive. Turn left at the end of the ramp onto Kenmore Avenue. Follow Kenmore Avenue behind the GM plant and turn right onto Vulcan Street. The soccer fields will be on your left. 190 to Rt 198 Scajaquada expwy. Travel 1/2 Mile. McCarthy park entrance is on the left. Field towards the back. Rt. 33 to 198 Scajacquada Expwy. From the north, take the Niagara Thruway (Interstate 190) South to the exit for Porter Avenue. Turn right and the end of the ramp and follow the ring road around LaSalle Park. As you begin to loop back toward the Park entrance, the soccer fields will be on your right. From the south, take the Niagara Thruway to the exit for Niagara Street. Turn left at the end of the ramp onto Niagara Street northbound. Proceed to Porter Avenue and turn left. Take Porter Avenue into LaSalle Park and follow the ring road around LaSalle Park, As you begin to loop back toward the Park entrance, the soccer fields will be on your right. Located at the old UB Campus (Main Street and Bailey Ave). The fields are along Bailey Ave across from Veterans Hospital (south of the Main-Bailey Intersection). From the 90 – exit onto to the 290 West and take exit 7A Main Street West. Bear right onto Main Street; go down about 3 miles to Bailey Ave – route 62 and turn left onto Bailey.